The Rams dropped to 3-point favorites over the Chiefs at most Las Vegas sports books on Sunday before creeping back up to 3½ on Monday at the South Point and Westgate. The line dropped to 3 at most Las Vegas sports books on Sunday before creeping back up to 3½ on Monday at the South Point and Westgate. “We just moved to 3½,” Westgate sports book director John Murray said Monday afternoon. “All week there was nothing but Kansas City money but we finally started to see some money show up on the Rams (Monday) morning. Los Angeles (9-1) opened as 1-point favorite when the game was still scheduled to take place in Mexico City. 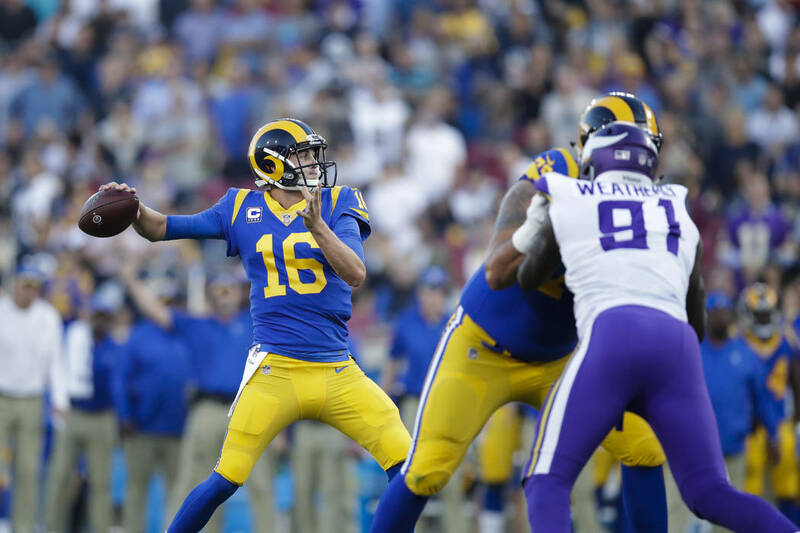 The Rams moved to 2½-point favorites before poor field conditions caused the NFL to move the game to L.A., after which the line was moved to 3½. Murray cautioned against betting on the popular underdog. A Westgate bettor placed a $5,000 wager on over the NFL record-high total of 63½. “We’ll need the under for a decent amount, which is not a big surprise,” Murray said. There are also plenty of props on the game. The same Westgate bettor who wagered on the over placed a $3,000 wager on Chiefs quarterback Patrick Mahomes to go over 326½ passing yards and a $3,000 bet on Rams QB Jared Goff to go over 322½ passing yards. Los Angeles’ team total is 33½ points and Kansas City’s team total is 30½ points. Todd Gurley’s total rushing yards is 106½ and Tyreek Hill’s total receiving yards is 90½.